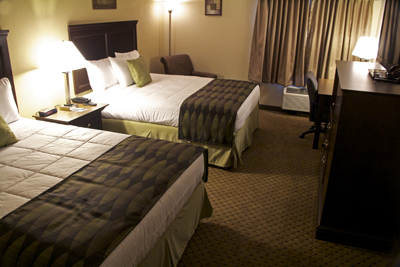 A comfortable, non-smoking room with 2 Queen beds that will hold up to 5 people. All Double Queen rooms are equipped with a 42-inch LCD TV, free Wi-Fi Internet access, microwave, refrigerator, electronic door lock, desk with ergonomic chair, high-back sitting chair, curved shower rod, hair dryer, iron with ironing board and coffee maker. 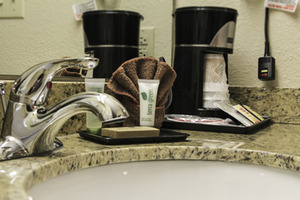 Includes our Daily Hot Deluxe Breakfast, Fitness Center, Guest Laundry and Outdoor Swimming Pool. 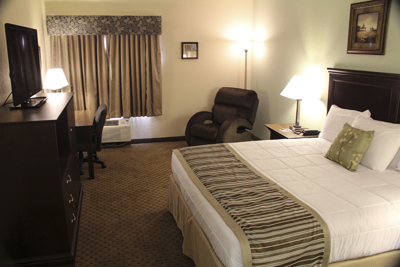 A comfortable, non-smoking room with 1 King bed that will hold up to 2 people. 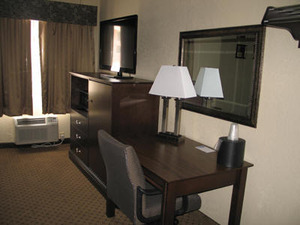 All King rooms are equipped with a 42-inch LCD TV, free Wi-Fi Internet access, microwave, refrigerator, electronic door lock, desk with ergonomic chair, recliner or loveseat, curved shower rod, hair dryer, iron with ironing board and coffee maker. Includes our Daily Hot Deluxe Breakfast, Fitness Center, Guest Laundry and Outdoor Swimming Pool. A comfortable, non-smoking room with 1 King bed and Sofa Hideabed that will hold up to 3 people. All King with Hideabed rooms are equipped with a 42-inch LCD TV, free Wi-Fi Internet access, microwave, refrigerator, electronic door lock, desk with ergonomic chair, curved shower rod, hair dryer, iron with ironing board and coffee maker. 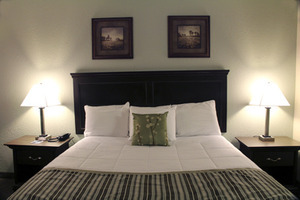 Includes our Daily Hot Deluxe Breakfast, Fitness Center, Guest Laundry and Outdoor Swimming Pool. 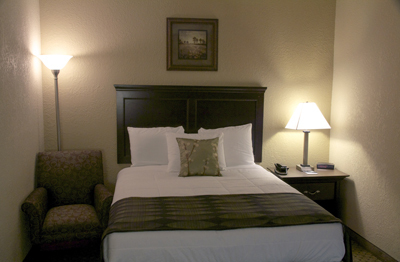 A comfortable, non-smoking room with 1 Queen bed that will hold up to 2 people. All Single Queen rooms are equipped with a 42-inch LCD TV, free Wi-Fi Internet access, microwave, refrigerator, electronic door lock, desk with ergonomic chair, high-back sitting chair, curved shower rod, hair dryer, iron with ironing board and coffee maker. 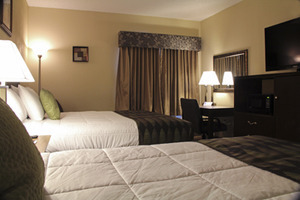 Includes our Daily Hot Deluxe Breakfast, Fitness Center, Guest Laundry and Outdoor Swimming Pool. A comfortable, non-smoking, ADA-compliant room with 1 Queen bed that will hold up to 2 people. The room includes a recliner and a larger bathroom with rails. All rooms are equipped with a 42-inch LCD TV, free Wi-Fi Internet access, microwave, refrigerator, electronic door lock, desk with ergonomic chair, curved shower rod, hair dryer, iron with ironing board and coffee maker. Includes our Daily Hot Deluxe Breakfast, Fitness Center, Guest Laundry and Outdoor Swimming Pool. 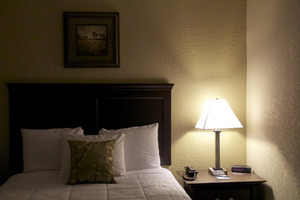 A comfortable, non-smoking, ADA-compliant room with 1 Queen bed that will hold up to 2 people. The room includes a recliner and a bathroom with rails and a roll-in shower. All rooms are equipped with a 42-inch LCD TV, free Wi-Fi Internet access, microwave, refrigerator, electronic door lock, desk with ergonomic chair, curved shower rod, hair dryer, iron with ironing board and coffee maker. Includes our Daily Hot Deluxe Breakfast, Fitness Center, Guest Laundry and Outdoor Swimming Pool. This room type is not available for one or more of your dates. Please call (417) 544-0306 to inquire about additional availability.